I don't very often do two posts in one day, but I was inspired to change it up thanks to the party going on over at the Lettered Cottage! My mantel doesn't go through too many transformations. I typically only do something different when the holiday season starts to roll around in the fall. But what the heck? Things could use some freshening up around here! Some of my most favorite creations are when I use things that I already have from around the house. 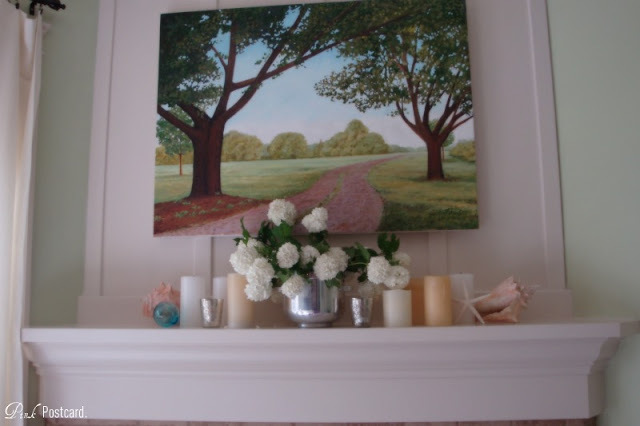 I kept it very simple- the painting my dad did for us is the focal point. I found the picture in a magazine and had him go from that. When he was done with it, it reminded me so much of one of our favorite parks. I adore it! The flowers are from our garden. These are snowballs- the same ones I've used before. 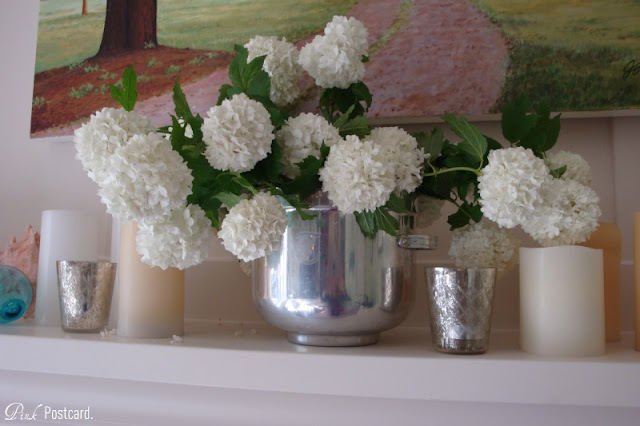 "Snowballs" and "summer" don't seem to go together, but they are part of the hydrangea family, and I love how full and airy they are. 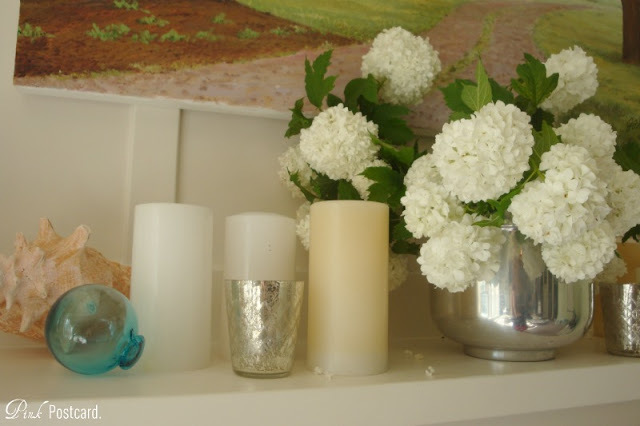 I gathered up all of the white and cream candles I could find around the house. I also have lots of seashells, but I picked out just a few to add in. A turquoise glass float also made it into the mix. I like how it ties into some of the sky in the painting. The silver piece that I used to hold the flowers in, is a vintage Buenilum ice bucket. It has a monogrammed T on the front. (you can see it better in the first photo) Old ice buckets make great vases! They're not as expensive or as hard to find as trophies, but often offer a hint of the same shape and shiny-ness. I love them! I added a couple mercury glass votives in as well for some more sparkle. I love the simplicity of it. Romantic, light, airy, and the hint of summer! 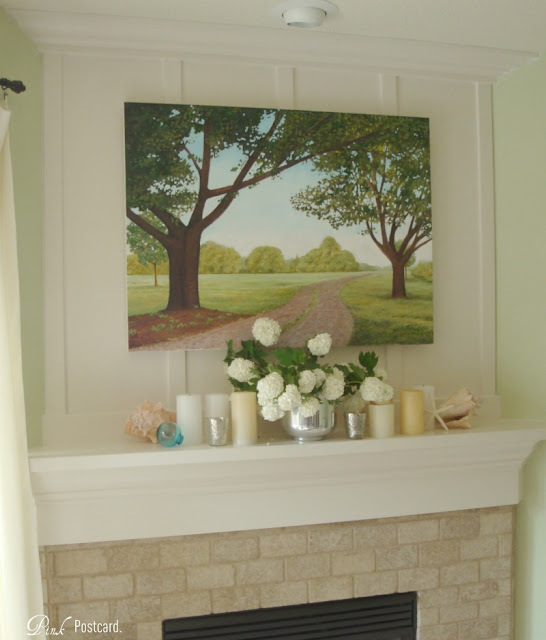 If you'd like to see the transformation of our corner fireplace and how we added the wall to it, you can find it here. I hope this gives you some summer mantel ideas to use what you have for a simple and fun new space! How special to have a painting done by your dad. It's beautiful, as is your mantel. Thanks for sharing. Oh my...what a beautiful painting...love it!!! I am really impressed with your painting your dad made. I was wondering who was the artist and scrolled back to see...got ahead of myself looking at the pics, you know. I love hydrangeas too! Oh denise! I love your blog, the name is adorable too, and so are you! Your father's painting is wonderful, 'm sure there is deep love in every stroke. I'm happy to be your newest follower...stop by and visit with me too, if ya like. The painting your father did is quite striking - I love it and that it is just the canvas not framed. It draws you right into the scene. The colors everything. I wish it were hanging in my house. Does he paint for a living? Thanks for hosting such a fun party! I'm new at the party thing, just learned how to do it and am having a lot of fun! Love your mantle, how lucky you are to have a painting by your dad! It's lovely! UGH - those blooms in the silver pot are GORGEOUS! Your mantle looks so pretty! It's is so gorgeous - I'm in awe!! Beautiful! 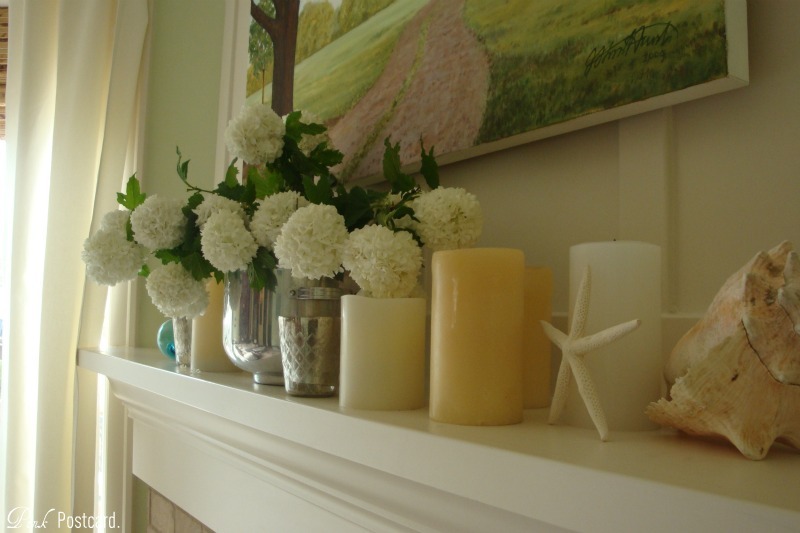 Flowers, candles and seashell...a few of my favorite things!!! Thanks for joining in on show and tell!